2017 flew by, didn't it! I hope 2018 is a much better year when it comes to blogging for me as last year it seemed I had quite a lot of bad luck if I'm honest! I love doing monthly favourites and I had a look back through each month of 2017 and instantly knew which products were my favourites from the whole year as I am still using them every single day and couldn't be without them! These products I recommend to everyone I speak to and I have backups of most at the ready. Last February, I was sent the Too Faced Chocolate Bar Palette (£39) and I was literally jumping up and down when it arrived as I had been wanting it for the longest time. It hadn't disappointed and I use it almost every single time I do my makeup and it has been the one eyeshadow palette I always go back to, it's foolproof. I loved it so much that I ordered myself the Semi-Sweet Palette shortly after I got this one and I just got the Chocolate Chip Palette too! This is one of those palettes that works with any eyeshadow look I am going for that day and I am always mixing shades from this with shades from other palettes. All of the shadows are soft, easy to blend and have great pigmentation, not to mention that this palette smells good enough to eat! I have never found the shades to crease orf ade throughout the day and I never use eyeshadow primer either. My favourite shades are White Chocolate, Salted Caramel and Marzipan. Sticking with the eyes, mascara's are one of those products that I am always excited to try out because they can really transform my makeup. I have tried 101 mascaras in 2017 but the Tarte Maneater Mascara is by far the best one I tried. I ordered one of the Tarte TSVs last year which included a bunch of Maneater products in and I honestly wasn't that fussed about trying it so it sat in makeup drawers for a few months before I actually used it and I am kicking myself now! This mascara gives my lashes a crazy amount of volume and so much length that my lashes basically touch my brows. Ever since I finished this no other mascara has impressed me so I can't wait for my new tube to be delivered soon! Another Tarte favourite of mine is the Shape Tape Concealer. I ordered this in April and there hasn't been a day when I have done my makeup that I haven't used this, believe the hype this stuff is phenomenal. This is a holy grail in my makeup bag and blows any concealer I have ever used out of the water. It has insane coverage without looking or feeling heavy on the skin and it brightens the under eyes well too. It's super long lasting and doesn't crease under the eyes. This is one of those products that everybody needs in their collection without a doubt. 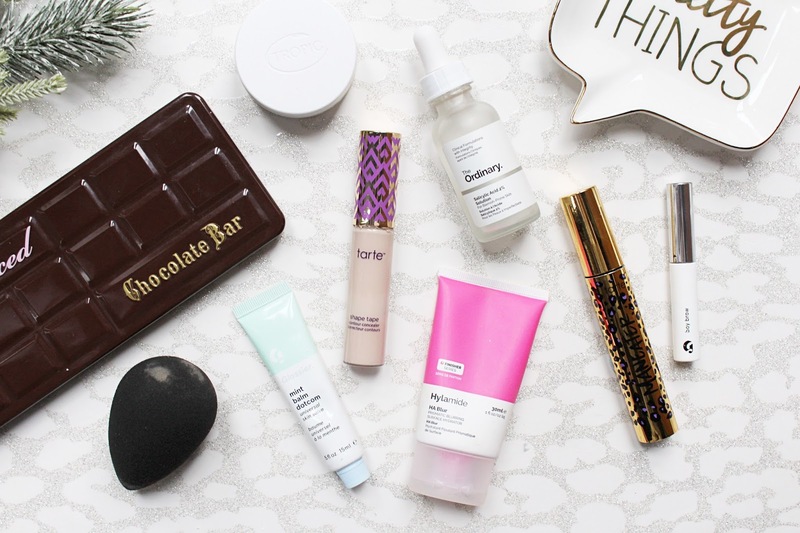 I had been waiting so long for Glossier to launch in the UK, I had been desperate to try their products as soon as they launched in the UK I ordered a selection of things to try out. I have been raving about them over the last couple of months and two of them I don't think I could ever be without again. The first is Boy Brow, I can't believe how much this transforms my brows! I have tried a lot of brow setting products and this one is completely different as it is more of a pomade than a gel and I have found it to work so much better! It keeps my brows in place all day long and as I have pretty crappy brows anyway I need all the help I can get and once I have filled them in and shaped them this actually makes the hairs stand out so they look slightly more natural. The other favourite is the Balm Dotcom, I have two of these as I love it so much! I have the Mint and the Birthday options and I can't get enough of them, I would love if they came out with a peach one! These keep my lips hydrated like no other and I am honestly addicted to the stuff! If you want to try Glossier, if you use *this link* you'll get 10% off your first purchase and full disclaimer, it gives me £10 credit when you use it. Another makeup related favourite of mine this year has been the beautyblender sponge. I seriously don't talk about this magical tool enough! I am onto my second one and I will repurchase this until the day I die, not to be dramatic or anything! I have been using this to apply my foundation and concealer consistently throughout the year and it just applies everything like a dream. It gives me flawless coverage without fail and it always leaves my base makeup feeling lightweight on the skin. I have even started using it to apply powder for baking and it's also fantastic to use throughout the day to fix any makeup mishaps. If you haven't tried the beautyblender yet, make 2018 the year you do! My final two favourites are both from Deciem family and the first is the Hylamide HA Blur. I have almost finished my second tube of this and if you want a primer to fill in your pores and smooth the skin, this is the product that you need in your makeup bag. You can mix this with makeup but I do prefer to use it as a primer and it has never failed it. This honestly makes my skin look as if I have photoshopped it and used the smoothing tool. The other is The Ordinary Salicylic Acid 2% Solution, this has honestly transformed my skin and given me so much more confidence. I am on my third bottle of this now and I have mentioned a thousand times that I have acne prone skin and really struggle with spots. This is the only product that can get my skin completely clear, I did a full review on this if you do want to know more about this, here. What were your favourites in 2017?